According to many economists, inflation upto a certain level is beneficial for the economy as it keeps the economy in a buoyant mode with vibrant and active economic activity. This inflation has to be in the range of around 2 to 4 % beyond which this inflation has the potential to create some problems for the economy. When in an economy the cost of goods and services is increasing at the rate of double digit or initial stages of triple digit inflation. It hits hard the middle and lower income group as there purchasing power decreases as no increase in earnings occur but the prices increase exorbitantly. This type of inflation is one step ahead of galloping inflation. In this type,the inflation rate goes even higher that three digits. This happens when the supply of money in the economy is excessively high and there is not enough production capacity. This happened with Germany in the post first world war era and also with countries like Argentina, Zimbabwe and Brazil in 1989 and 1991. This happens when three adverse conditions occur simultaneously - (Extreme Unemployment, High Inflation and Poor Economic Growth). 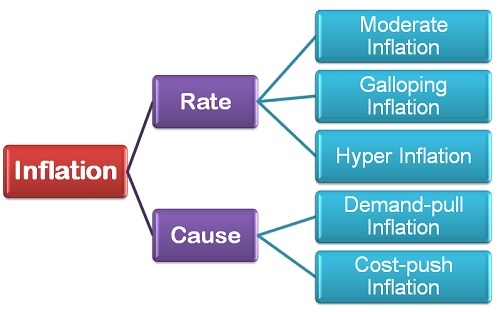 Means negative inflation which means the prices are decreasing which may be due to reduced money supply in the economy or may be due to excessive supply of goods and reduced demand in the economy. This may seem as good thing as prices are reducing which may benefit the consumers however it has the potential to hurt the economy in the long run by reducing economic activity of the companies due to reducing profit on account of decreasing prices thereby accentuating unemployment. This inflation occurs due to increase in the prices of land, labour and entrepreneurship used as inputs in the production of goods and services. When demand exceeds the available supply.